Thursday and Friday, in between everything else, I worked on Heart Blocks. They are being made en mass to help the Orlando Modern Quilt Guild make quilts for the victims and families of those massacred in Orlando last week. I am trying to use my best fabrics and make them as cheerful as possible. I also started out with the orange and went to the purple, thinking that blocks in these colors might be in short supply. I could make the whole rainbow range, as I saw someone else do on IG, but I don’t know that I want to do that. I hope to make some more orange ones, regardless. We’ll see what happens. I found it easier to cut a bunch of backgrounds and foregrounds and sew them all at once, though I didn’t do that every time. 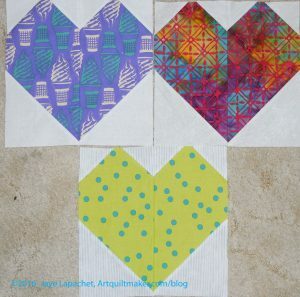 The four blocks above are the first 4 I made and the 3 in the second photo are the ones I made Friday and finished on Saturday morning before the meeting. I was pretty excited about the purple soft serve fabric. I really hope that fabric will make someone smile and will bring back good memories of the Boardwalk or the Fair. It made me smile. 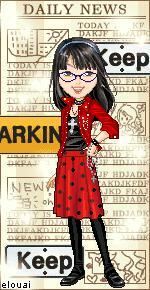 On Saturday I attended the BAM meeting. 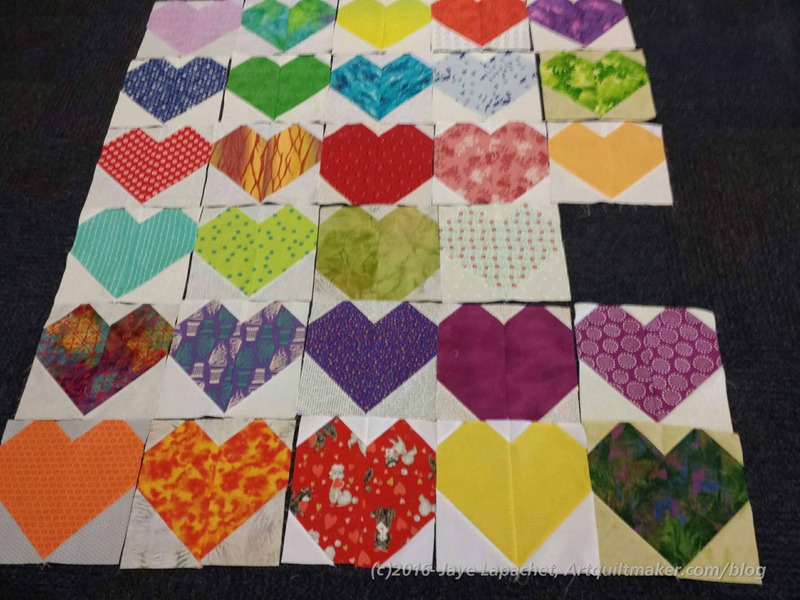 After the meeting, which was GREAT, BTW, a number of us stayed and made blocks for Hearts for Orlando quilts. 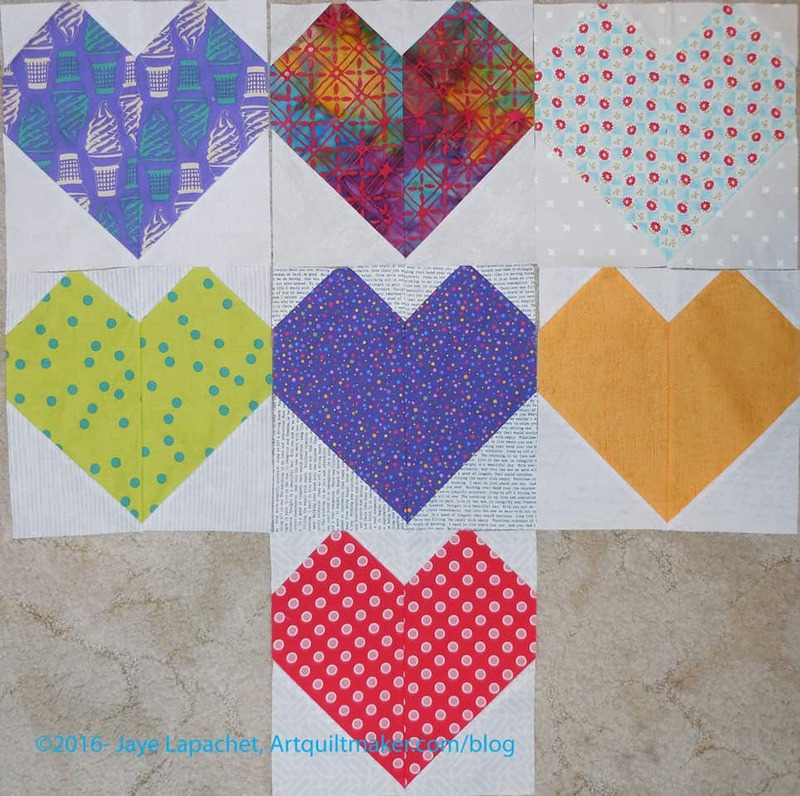 We made 41 blocks, which is enough for 1 1/4 quilts. You can see that there are some differences in the blocks. There were some differences in cutting so I looked up the pattern and found that I was cutting the small background squares, used for the top, wrong. 🙁 Those small background squares are supposed to be 2″ not 2.5″. We kept all of the different types of hearts. It will add interest to the quilt. I wasn’t the only one who made a mistake and everyone was really generous. 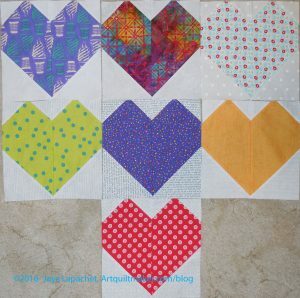 Valerie, a Twitter pal, made enough heart blocks for a whole quilt. All I can think about is that this could have happened to one of my family or friends or work colleagues. None of us are immune. 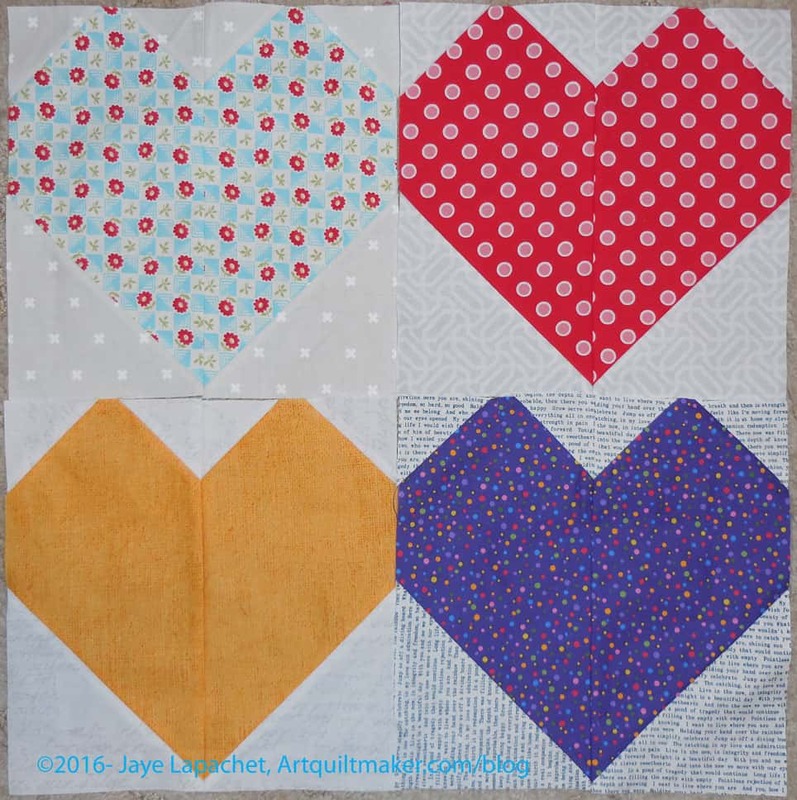 In true quiltmaker fashion the Orlando Modern Quilt Guild has started a block and quilt drive to create quilts for the victims and families of the slain. They are collecting quilts and blocks. 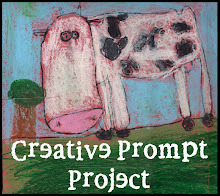 Send this form with your submission. The idea is to make heart blocks in bright, rainbow colors to represent everyone affected (including YOU), and obviously represent the love we are sending them. Use the tutorial from Cluck Cluck Sew to make 10? blocks in rainbow of bright colors, with a low volume background. 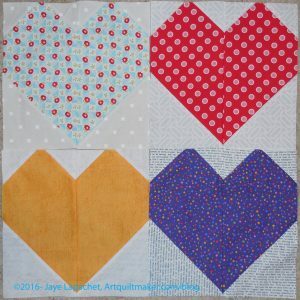 The quilts should be no smaller than 5 blocks wide and 6 blocks long (30 blocks). You’re more than welcome to make them larger, they’d like to keep them at the very least lap sized. A lot of questions were brought up in the comments on the original Orlando MQG post. This is a big project and they are working through the details as those details come up. Be patient. Most of the answers have been posted a few days ago, including what you can send (quilts, blocks, batting, money, binding strips, etc). Also keep an eye on that blog for more information. I am sure your patience will be appreciated. Contact Julie at the Intrepid Thread for more options. If you have any other questions, please email alissalapinsky [at] gmail [dot] com. She is the president of the Orlando MQG and coordinating this effort. Do something! Help in some small way- whatever works for you. Even $1 will help buy batting and pay for postage.